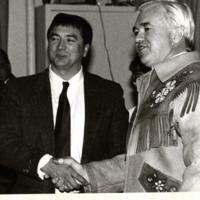 A photo of Willard Hagen shaking hands with another man dressed in a traditional clothing. 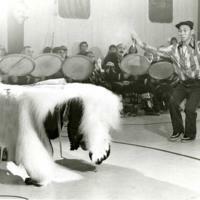 The photo shows a man dancing away with a few drummers playing in the Signing ceremony in Sachs. The photo includes: 1. Silas K. , 2. 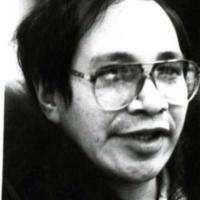 Old Raddi Kowachuk, 3. Alex Gordon, 4. Amos Paul, 5. Ralph Kimiksana, 6. Jean Arey. 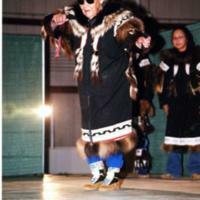 The photo shows Dancer Sarah Mangelana performing on stage with a few other dancers. 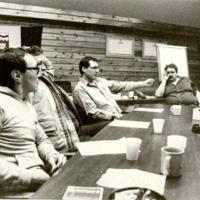 The photo shows a group of men sitting at a table in a wooden building having a meeting. The photo includes: Left to Right: Vince Teddy, Alex Aviugana, Roger Gruben, Knute Hansen, Unidentified Person. 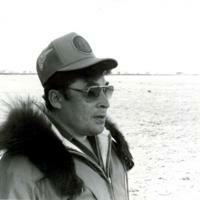 A head photo of Robert Kuptana dressed in a nice traditional parka, wearing glasses. 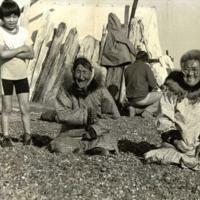 The photo shows several elders sitting and kneeling on some rocks playing the ring toss game. 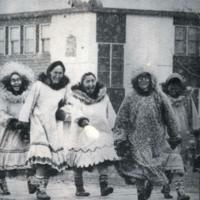 The photo includes: Left to Right: Jane Esau, James Gordon, Jean Tardiff, Kathleen Hansen, Identified Person. 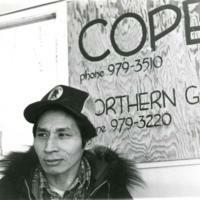 A photo of Peter Green dressed in a traditional parka, standing by a sign that says COPE on it. 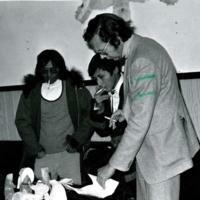 The photo shows a group of people standing around a table that has many different Carvings on it. The photo includes: Left to Right: Nelson Green, Peter Green, Unidentified Person. 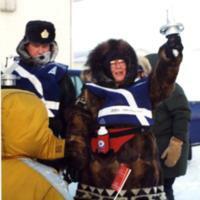 A photo of Nellie Cournoyea standing up in a nice traditional parka, holding a torch of some sort. We also can see a police officer and a couple others at the Canada Trail Opening. 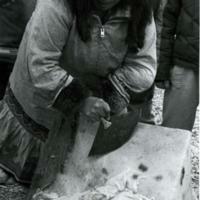 A photo of Mary Kudlak using a ulu on some hide, with a couple of people standing around her. 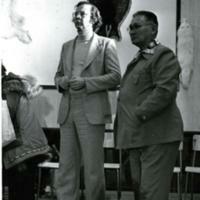 The photo shows a couple of men standing together in a room with a couple of furs on the wall. The photo includes: Right: Mark Noksana. 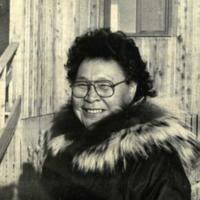 A photo of Lena Wolki dressed in a traditional parka sitting down. 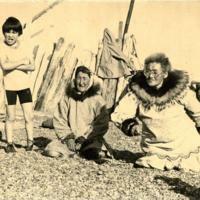 A photo of Henry and Florence Nasogaluak, the dog race winners at the Tuk Jamboree. Florence is seated on a basket sled. 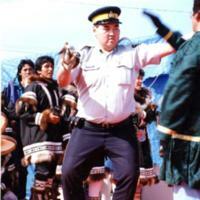 A photo of a RCMP Officer dancing on stage with a few others standing around him. The photo includes: 1. Leslie Gordon, 2. Glen Gordon, 3. Priscilla Kayotuk. 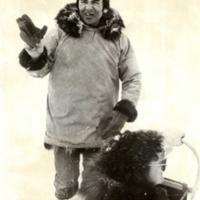 A photo of Garrett Ruben standing on the land, dressed in traditional parka. 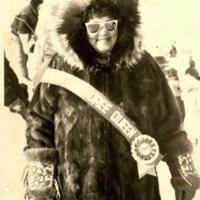 A photo of Elizabeth Hansen, the 1989 Muskrat Jamboree Queen standing outside in a nice traditional parka, also wearing glasses and smiling. 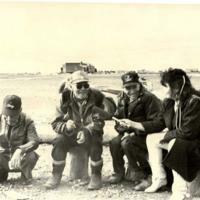 A photo of Ed Ruben, Freeman Kimiksana, and another man being interviewed by Brenda Dillon. 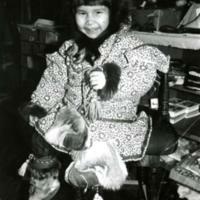 A photo of a young Cara Dillon sitting down on a chair dressed in traditional parka.